Here’s the announcement regarding my book signing at the Orinda Bookstore. Hope you can join me! Rose Marie “Rosemary” Kennedy was the first daughter born to Rose Fitzgerald and Joseph P Kennedy Sr. At the age of 23 she underwent a labotomy which left her unable to walk, talk or perform basic human tasks and was sent to rural Wisconsin to a Catholic run home for the mentally disabled. There she was looked after for 35 years by Sister Paulus Koehler, the authors aunt. 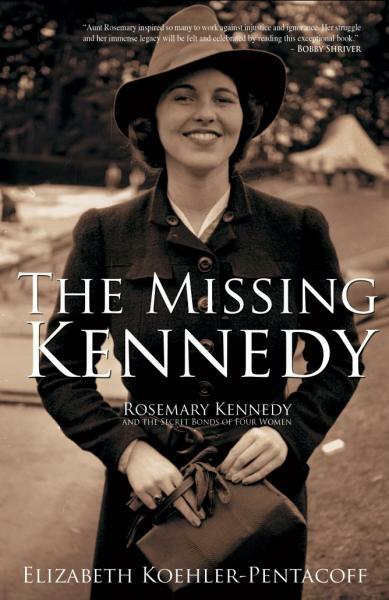 The Missing Kennedy is an insightful, important and poignant memoir that chronicles Rose’s life and includes many never-before-seen private photos, Kennedy quotes from the author’s interviews, and anecdotes about Rosemary and her famous family. Come and hear author Elizabeth Koehler-Pentacoff discuss the research and work behind the book (recently featured cover story in PEOPLE Magazine Sept 14th) and share her own personal relationship to Rosemary. Last night my friend, H and I took BART into San Francisco to hear an author and political commentator discuss his new book. Every seat was filled. Two hundred people? It was great to see many people do continue to read and think, and care enough to show up. H and I agreed we could have stayed all night listening to this well-thought man discuss history and politics, not just media babble. When it was question and answer time, he talked about the importance of getting facts correct. How refreshing! I’m reminded of why I don’t like watching television news much anymore, since these days rumors and name-calling are often reported before information is verified. Who gets a story first is more important than who gets a story right. Afterwards, we walked city streets to a restaurant. On Market Street, the light our way, another couple and my friend began to walk. But a red truck made a right turn into their path . . . and kept on coming. For a moment – - everyone paused. But no, upon checking, we did have the right away, so even I stepped off the curb, but the red truck continued. I threw out a protective hand in front of H, who would be first in the truck’s path. Finally, the man at the steering wheel stopped. Guess he didn’t want her as a hood ornament. The man next to me laughed as we cross the street. “Did you see his bumper sticker?” he said. “I brake for bikes. Share the road!” he said. Then we all smiled at the irony. Guess the driver didn’t mean pedestrians. 1. As you watch television, note when there is news (facts which can be verified) and rumors and opinions. If a person resorts to name-calling, look beyond the labels and seek what is behind it. Is the person in front of the camera an entertainer or a reporter? What is the person’s credentials? Reputation? Can you check the facts? Write a piece where you need to use research. Back up your story or article with facts. Make sure you keep your references. 2. Look for bits of irony and general humor in your daily life. Jot it down when you find it. Even sad moments can have a bit of comedy in them. How else do we survive tragedy? Write a personal narrative, poem or story where you can include a bit of both. 3. Watch a movie and identify the moments of humor and sadness and how close they come together. How much facts are in the show? Opinions? 4. Attend an author talk. What does the author do well? Remember this when it’s time for you to do your book presentation! Are you the mother of a child with special needs? Nonfiction. Up to 6,000 words or 6 poems. Barbara Bentley (A Dance with the Devil: A True Story of Marriage to a Psychopath). When life threw her an unexpected curve, Barbara took the experience and turned it into a book to help others understand the crazymaking world of the psychopath. Her story has been featured on Dateline NBC. Alfred J. Garrotto (The Saint of Florenville: A Love Story) A native of Santa Monica, CA, Al now lives in Contra Costa County. In addition to his writing career, he serves as a lay minister specializing in adult faith formation in a local Roman Catholic parish. If you have any interest in writing and being published this is a “must-attend” event. Announces a FREE opportunity for students, educators and readers to meet published authors – - – and students, how to win hundreds of dollars by writing!